Fashion Scout were delighted to welcome back Toni & Guy for our SS18 season, celebrating their 27th season as official hair sponsors of London Fashion Week. Starting in London, the now global business has over 485 salons across 48 different countries. Renown for the outstanding services they provide and products they work with, Toni & Guy has won 66 British Hairdressing awards, and 113 product awards, voting them ‘Best Avant Garde’, ‘Most Wanted Creative Talent’ and ‘Franchise of The Year’ to name a few. The creative innovators of Toni & Guy designed unique, unusual and inspiring looks for our SS18 catwalks and presentations depicting the individual character and personality of each of our wonderful designers. The Hellavagirl catwalk saw the outrageous styles that Toni & Guy had to offer for our SS18 shows. Hellavagirl’s Rock Star Couture presented a genderless collection, designed to allow the wearer to fully express themselves. The theme of self expression was also visible on the diverse, bold and dramatic hairstyles created for the performance show. 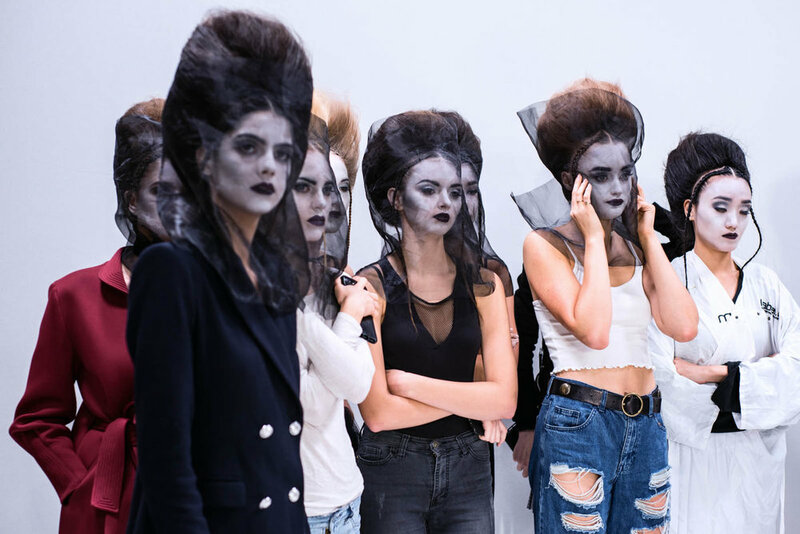 The Toni & Guy hair stylist created a gothic look reminiscent of the victorian era for the John Herrera show which gracefully complimented his elegant evening gown and formal wear collection for SS18. The sleek, birds nest style, alongside the mysterious netting facial coverings wowed the audience. The artists of Toni & Guy mastered the wild look for the Elephantasia show. The volumised, free flowing style complimented the theme of Elephantasia’s work, showing the natural beauty and style of African Wildlife. Backcombing and teased strands gave purpose to the freely styled look. From the diverse works of art that the hair stylists of Toni & Guy created for SS18, it is clear to see their immense talent and hard work. The visual characterisation of the individual shows would be impossible without the precise details and messages that the hair design can portray to an audience. With each dressing room full with individual, unique and dynamic stylists and the catwalks full of innovative creations; The Fashion Scout atmosphere and ambience was extraordinary.